Adds 4, 5, 6, 7 to the team's roll, but can subtract -1 coin or -1 coin instead. 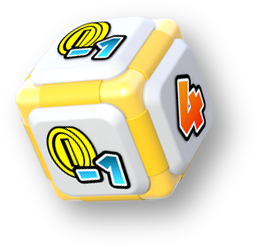 The Greedy Dice Block is Wario's special, yellow Dice Block from Mario Party: Star Rush. In Toad Scramble, when players have Wario in the party, he can roll a 4, 5, 6, or 7 to add to the player's total roll, but the Dice Block has two -1 coin slots that can subtract one coin without adding any numbers to the total roll. A similar Dice Block is Waluigi's Risky Dice Block, where it can roll overall higher consistently but can subtract more coins as well. This page was last edited on February 26, 2019, at 23:14.